“It is truly an honor to serve the community of Guthrie and we are excited to continue to do more for our customers at our future, brand new location,” Guthrie IBC branch manager Ethan Kieffer said. On hand for the ceremony was several IBC Bank officials, including current board director and former Oklahoma Governor George Nigh, Guthrie Mayor Chuck Burtcher and Chamber CEO Mary Coffin. Construction will soon begin on a state-of-the-art building with the hopes of it opening in March of 2013. The bank will honor the history of the bank and the city with a look that compliments both. Artifacts from the bank, that date back 106 years ago, will be on display in the remodeled version. Before the new building is erected it must come down. The demolition is expected to start early next week. In the meantime, it’s business as usual for the bank in a temporary building behind the existing building at 120 N. Division. Nigh announced the bank is investing two million dollars into the project and IBC, who has its headquarters in Laredo, TX, has remodeled 37 of the 52 bank locations in Oklahoma. 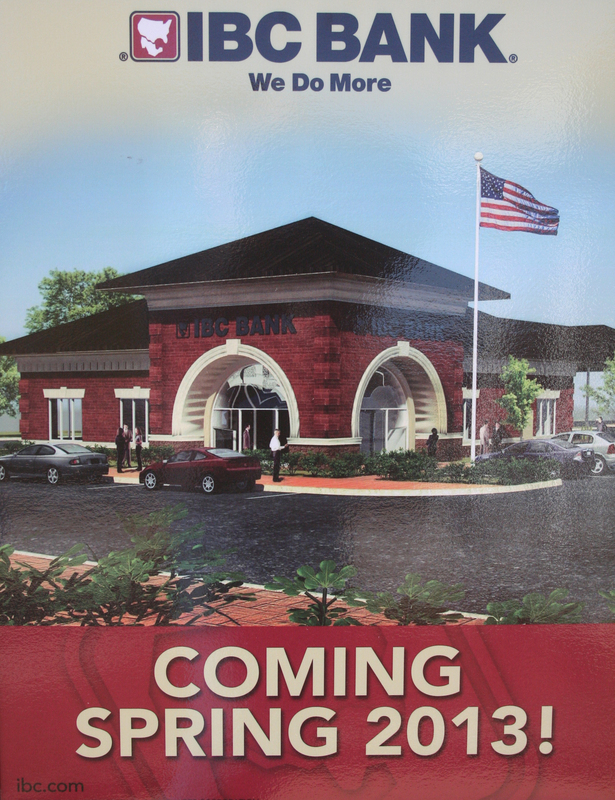 In addition of offering deposit and loan products for retail and business customers, the new building will feature a conference room that’s open to the community, three motor bank drive-thru lanes and a drive-up ATM machine. 3 Responses to "IBC Bank set to demolish and rebuild downtown bank"
I don’t think the bank building was that old. I remember a grocery store being there before it became a bank. Any input? Janey – you’re correct that building was built in the early 80’s, maybe late 70’s. I think they have 106 year old artifacts from previous banks that have been resold through the years.